Spectacular scrub with a cleaning effect and immediately visible. With a mixture of argan and rice powder, it softly removes dead skin cells to reveal a smooth and soft skin thanks to the argan, mango and shea butters. 1 to 2 times a week, apply an even layer on the body dry skin and proceed to scrub with light circular motions until the cream is completely eliminated. Rinse. Rough skin, loaded with toxins and impurities. Can be used without a shower. Rinse with a damp towel. - Kaolin : Absorbs dirt and slows their training. 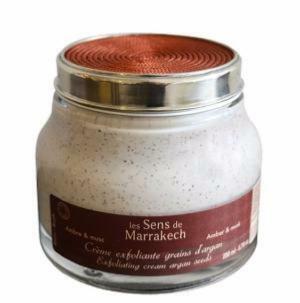 - Rice powder and argan seeds : micronized particles that create a synergistic micro peeling depth (rice) to a surface exfoliation (argan seeds). - Argan, mango and shea butters : Repairing and nourishing. Immediate and visible effect on the long term. - Argan oil : Soothes and nourishes .